Let’s talk about stocks. Based on results from the phenomenal 2015 season, this is your guide of which bands to buy stock in right this instant, which bands to hold onto and not panic, and some sleeper bands to invest in that many people might not have noticed. That is if you could buy stock in a band like you could in a business. Season-to-season predictions are a fickle thing, but keep in mind, like all investments, this is not meant to be for next fall, but rather for 3+ years in the future. Without further ado, this is your guide to investing in the theoretical stock market of marching band. William Mason: If there’s one band you want to own stock in, it’s William Mason. I absolutely loved their show this year, and they finished higher than even I expected them to. 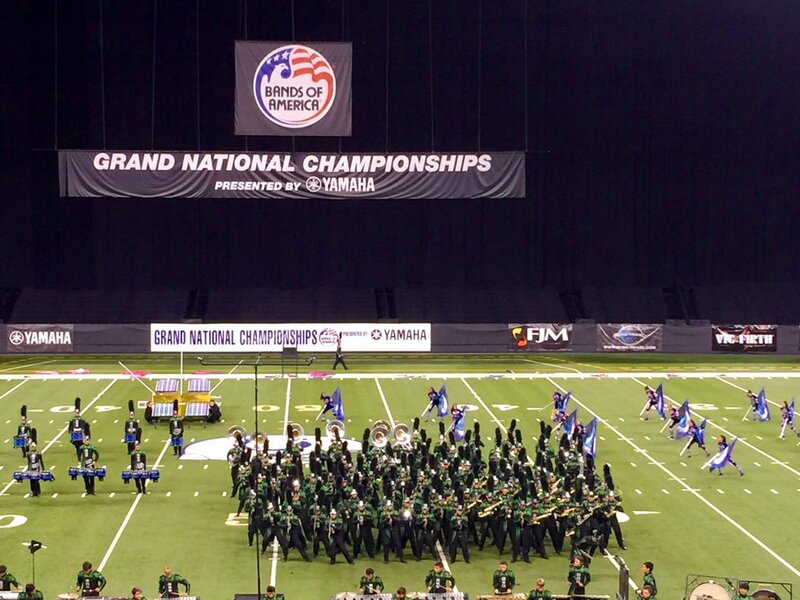 In the last few years, their improvement within Grand Nats Finals has been incredible. Within the next five years, barring something crazy happening, I firmly believe the Eagle will be in Ohio. Blue Springs: The first band to make finals from Missouri is second on my list of stock to invest in. I live in Missouri, so consider this a heartfelt "congratulations" to anyone from Blue Springs. The sky’s the limit for this Kansas City program, so invest while you can. My five-year projection for these guys does not include the Eagle, but I do think that they will be in the discussion for best band in the country. Flower Mound: I can’t not include Flower Mound. They blew all expectations away at San Antonio, and their explosion onto the scene last year took everyone by surprise. Are they too good to be true? I could see them being a flame out, except they are surrounded by pure excellence in Texas and I just can’t pick against the kind of success they had this year. Within the next five years, I think they will be back in Indianapolis at least once as the favorite to win it all. California Bands: We all know Ayala, and their success is constant. But Homestead (CA) was phenomenal in prelims at Grand Nationals, easily made semifinals, and then seemingly slipped out of everyone’s minds. Well, they placed 19th, less than five points out of finals. At the American Canyon regional, they were second, ahead of Clovis West, a great program, and three points behind Saratoga. If Saratoga were to attend Grand Nats, would they be a potential finalist? I’m investing in the state of California bands, and in the next five years, I’m willing to bet a program not named Ayala from the Golden State makes finals. Franklin: Yes, they fell enough in placements to scare us last year, but they returned to inching ever closer to a finals berth. This time around, they finished 13th and just .6 out of finals. It's good to see them back on track, and within five years, I think they make it into finals (and maybe sooner than we think). Dobyns-Bennett: Let's just keep calm with the Tennessee bands. DB is another great program from the Volunteer State, and although many people think they took a step back this year, I believe they were a little overhyped coming into the season, and they placed exactly where we at HornRank were expecting. I think that they are on a similar trajectory as Franklin, and they will also make an appearance in finals within five years. 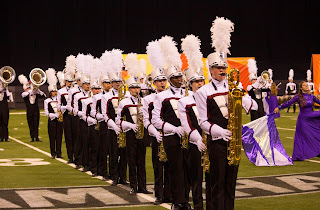 Eden Prairie and Rosemount: Eden Prairie not making semifinals was a shocker to everyone and undoubtedly will have dampened the expectations of many for Minnesota bands in the future. However, I don’t think it is time to jump ship yet. I’m always a big fan of these bands when I see them in person, and I think that Eden Prairie missing semis is just a blip. In five years, these bands will still be perennially in the top half at St. Louis. Wando: I’ll be the first to admit, their placement at Atlanta was concerning. But when you consider the environment that this school was in, I don’t think there’s any reason for the worrying. The only concern in this situation goes to the town, the school, and the victims of the flooding in South Carolina. I don’t personally know the details or extent of the damage, but I’m confident that Wando returns to finals and is contending once more in much less than five years. We at HornRank wish the best of luck to all involved in the recovery. Blue Springs South: Yes, as the name would suggest, these guys are just south of the aforementioned Blue Springs. No, they are not as well known, nor do they have the same resume as the first finalist from Missouri. But they have a similar situation and program, have a great reputation and high expectations within the state, and I think that within five years, they will be quite the force to be reckoned with. Clarksville was just the beginning. Lincoln: In person at the St. Louis Super Regional, these guys were one of my absolute favorites, and I was blown away by their volume of sound. Overall, I just came away impressed. South Dakota isn’t a state usually associated with the marching band scene, but I think that within five years, Lincoln will put it on the map. Look for continued success and improvement at St. Louis, and I would be fascinated to see them at Grand Nationals. North Hardin: They made their first appearance in our Top 30 this year, and I don’t think it will be their last. 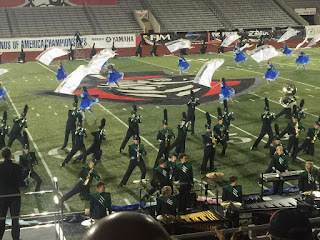 They’ve quietly been having great success in Kentucky and at BOA events for years, and at the Dayton regional this year, they were just 3.3 points behind Carmel. I believe Kentucky is a rebounding state on the Bands of America scene, and North Hardin is leading the charge. Expect them to be in the Grand National Finals bubble discussion in the coming years. Joe E. Newsome: This band from Florida made their first BOA appearance ever this season, and boy was it quite the debut. Winning the Newark Regional is not an easy feat, and although there are certainly more competitive events, a win over the likes of Norwin, Trumbull, and James Madison is no joke. I don’t know what trajectory the Newsome band is on since there’s simply no past information to go by, but if they continue this level of success, I’m willing to bet that in five years they could be recognized as the second-best marching program in Florida. Agree? Disagree? I’d love to know which bands you feel are the right ones to “invest” in. Let me know in the comments who your choices would be. The future is undeniably bright for BOA, so there are plenty to choose from. Nah I know, I'm from Blue Springs and I'm currently a junior. I meant would you invest in them? I can't speak for Jakob, but Grain Valley is a hard one. 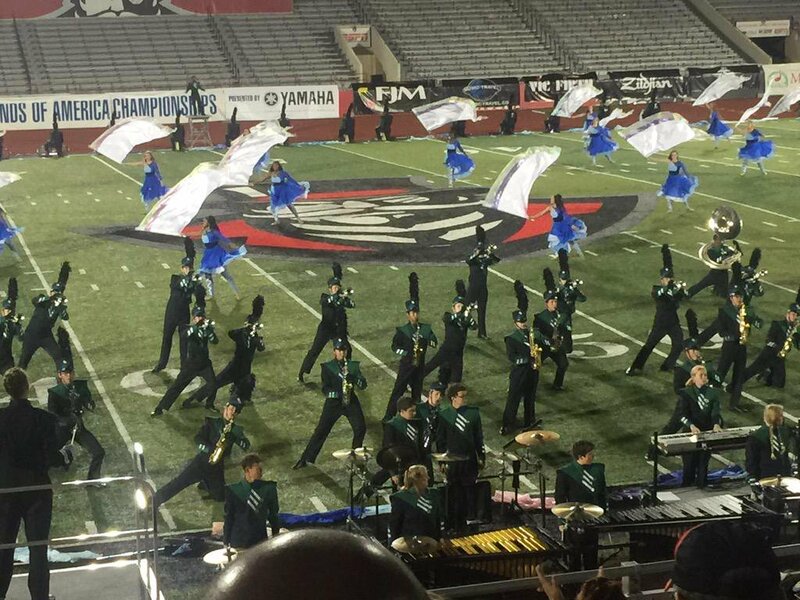 They didn't make finals at either St. Louis or Atlanta in 2015 after making finals at St. Louis in 2014 (10th in prelims, 14th in finals). We'll see if they can start moving back in the right direction next year. Seeing as they're going to BOA St Louis again, thats pribably going to be their only big competition this year because of Macys. I hope to see them in the top 14 again, maybe then they can be on this list. I think Bentonville (AR) is another group that's showing a lot of rapid improvement. Scott Tomlinson moved their from Broken Arrow several years back and has been doing great things with the school. Unfortunately, a second high school is opening in the district and so they might experience a bit of a hiccup this year, but hopefully they'll continue their upward growth and maybe be in finals in a couple of years. Heck, realistically Newsome could already be the second best program in FL to be honest. I'm calling it right now: within the next decade, Mason will win nationals, Blue Springs will break top 8 at nationals, Wando will return to their former glory, FloMo will be the sixth TX band to win nationals, and Bentonville will break into finals. All these bands are following in the footsteps of other programs who used to struggle to make finals and are now regular finalists. Bentonville has to be the group to look out for. They obliterated one of the people on the look out list. Tomlinson is there, the band is huge and they cut tons and tons for the contest band. The new high school is a soft open, so they lose practically no one in the coming years. Michael Gray, Michael Klesch, Richard Hinshaw. Hell, one of their visual techs (Wes Pendergrass) writes for several regional finalists, so they even have someone in house that can make things work. With a talented staff, kids to cut, the broken arrow lineage, and the ability to see great judging at boa regionals and tulsa shows, they are in a position to only get better and better. Grain Valley definitely needs to be on here! They have beat Blue Springs South in all competitions in the last 2 years, if you think you should watch out for South you should watch out for them too. They have come a LONG way!!! I think it is great that Lincoln, Rosemount, and Eden Prairie are on here but what about Bellevue West? They have been consistently been getting better and better at the St. Louis Super Regional. Heck they beat Union in prelims this past year. If anything 2016 looks like it will be more success for them. 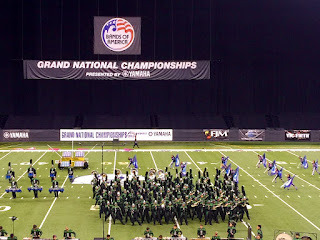 I've heard rumor that they may be going back to Grand Nationals this year and if they do, then they will be a band that shouldn't be taken lightly. Will they win Class AAA? I don't expect them to. (Especially with Leander, Cedar Park, and Kennesaw Mountain in their class) But if they do go, they will likely make semifinals. Also, watch out for them at St. Louis. They could very well finish ahead of Blue Springs and Union if they have as good a show as last year. All in all, Bellevue West is a strong Midwest program and I think they will continue to get better and better. I can understand that. But is Bellevue West going to St. Louis this year? I thought that BOA conflicts with Nebraska State Marching Championships this year. I hope they do to but if not we still have Blue Springs, Owasso, and Union to look forward. Broken Arrow might go but the last time BA did the Rose Parade, the only BOA event they did was Grand Nationals so we'll see on BA. Marian Catholic might go to St. Louis since they usually start their BOA Season in mid-October and the Indy Regional isn't until the week before Grand Nationals. Personally I would like to see a pretty big Texas band go to St. Louis again. By that I mean it would be cool if any of the Lewisville ISD Schools or LD Bell came to St. Louis. I have previously given you grief over not ranking California bands, my apologies. Saratoga is a true up and comer out west and although rebuilding Clovis West is a fine program. Homestead and Amador Valley as well. Keep up the good work! Watch out for California to have a consistent presence at Grand Nationals and with TWO Regionals in CA, I think you will be seeing more participation from CA bands. In fact, I believe there will be up to three CA bands at Grand Nationals this year: Clovis West, Ayala, and Vista Murietta. Homestead is tentatively planning to return to Grand Nationals in 2018, and compete in both CA Regionals each year moving forward. Word on the street is Wes Cartwright is at Bentonville West. Bentonville won't even be the best school in town, let alone an up and comer, in just a year or two. I think you will see that both Bentonville Schools will have a lot of success in the future. Both have young staffs with lots of creative people surrounding them. Tomlinson at Bentonville High School along with Tim Hendrix will make the group do incredible things. Word on the street is the show they have designed is going to be one of the better things we will see this year at Grand Nationals from a design standpoint(Which I think has been the biggest lack in their success). Albert Ortiz @ West is young director with a corp pedigree and with the help of Wes Cartwright will get where he needs to be. But I don't think you will see them on any relevant stage for the next 4-5 years. Both schools will have deserving programs. Irondale is having great seasons in winter drumline and winterguard and we're going to build on that momentum for the marching band season. Our numbers will be up next year and as always we'll have a good show, so I expect big improvement. Kiski's always been fantastic and almost won nationals in the 90s. Like all powerhouse bands, though, they have their uphill trends and downhill trends for a multitude of reasons, but after this past year in Indy, I beleive they'll be back in the finalist stage soon enough. My guess is they're absent from here because most groups listed were relatively unheard of a decade ago.